When ordering skylight blinds to fit Roto windows you need to know your Roto window size code. This guide describes how you go about finding the code and what to do if you cannot find your Roto window size code. Step 1: Finding the Roto window ID plate. Start by opening the Roto window and looking along the edges of the window for a metal plate or sticker. 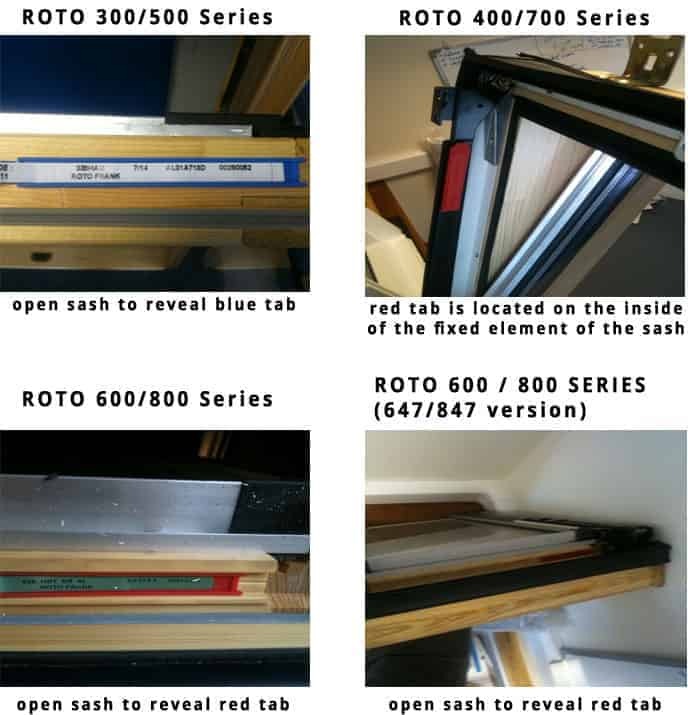 As long as you can find the Roto size code you can go ahead and order blinds for your Roto windows. All our blinds come with quality thermal blackout fabric, solid metal fixings, child safety certification and 3 years warranty as standard. The skylight blinds are extremely easy to fit, check out our fitting instructions video. Step 3: What to do if you cannot find your Roto window size code. You may find that the Roto Identification plate/sticker is not on the window or the information on the ID plate is worn or faded. If this is the case you will need to find out the window size by measuring the visible glass size of the window inside the window frame in centimetres (cm). When ordering skylight blinds to fit dakstra windows you need to know your dakstra window size code. This guide describes how you go about finding the code and what to do if you cannot find your dakstra window size code. Step 1: Finding the dakstra window ID plate. Start by opening the dakstra window and looking along the edges of the window for a metal plate or sticker. As long as you can find the dakstra size code you can go ahead and order blinds for your dakstra windows. All our blinds come with quality thermal blackout fabric, solid metal fixings, child safety certification and 3 years warranty as standard. The skylight blinds are extremely easy to fit, check out our fitting instructions video. Step 3: (Optional) What to do if you cannot find your dakstra window size code. You may find that the dakstra Identification plate/sticker is not on the window or the information on the ID plate is worn or faded. If this is the case you will need to find out the window size by measuring the visible glass size of the window inside the window frame in centimetres (mm). When ordering skylight blinds to fit keylite windows you need to know your keylite window size code. This guide describes how you go about finding the code and what to do if you cannot find your keylite window size code. Step 1: Finding the keylite window ID plate. Start by opening the keylite window and looking along the edges of the window for a metal plate or sticker. As long as you can find the keylite size code you can go ahead and order blinds for your keylite windows. All our blinds come with quality thermal blackout fabric, solid metal fixings, child safety certification and 3 years warranty as standard. The skylight blinds are extremely easy to fit, check out our fitting instructions video. Step 3: (Optional) What to do if you cannot find your keylite window size code. You may find that the keylite Identification plate/sticker is not on the window or the information on the ID plate is worn or faded. If this is the case you will need to find out the window size by measuring the visible glass size of the window inside the window frame in centimetres (cm). When ordering skylight blinds to fit FAKRO windows you need to know your FAKRO window size code. This guide describes how you go about finding the code and what to do if you cannot find your FAKRO window size code. Step 1: Finding the FAKRO window ID plate. Start by opening the FAKRO window and looking along the edges of the window for a metal plate or sticker. As long as you can find the FAKRO size code you can go ahead and order blinds for your FAKRO windows. All our blinds come with quality thermal blackout fabric, solid metal fixings, child safety certification and 3 years warranty as standard. The skylight blinds are extremely easy to fit, check out our fitting instructions video. Step 3: (Optional) What to do if you cannot find your FAKRO window size code. You may find that the FAKRO Identification plate/sticker is not on the window or the information on the ID plate is worn or faded. If this is the case you will need to find out the window size by measuring the visible glass size of the window inside the window frame in centimetres (cm). When ordering skylight blinds to fit VELUX windows you need to know your VELUX window size code. This guide describes how you go about finding the code and what to do if you cannot find your VELUX window size code. Step 1: Finding the VELUX window ID plate. VELUX window size code identification plate examples and locations. Step 2: Finding the VELUX window size code. There are two parts to the VELUX window code, the window type and the window size. The window type, usually three letters like GGL,GHL,GZL,GGU and so on is not relevant for purchasing blinds for VELUX windows, you don’t need it. The important part of the code is the window size code, this can be up to 4 characters depending on which year the window was made. For example, windows made pre 1992 have just one or two characters whereas windows made post 2014 have four characters. 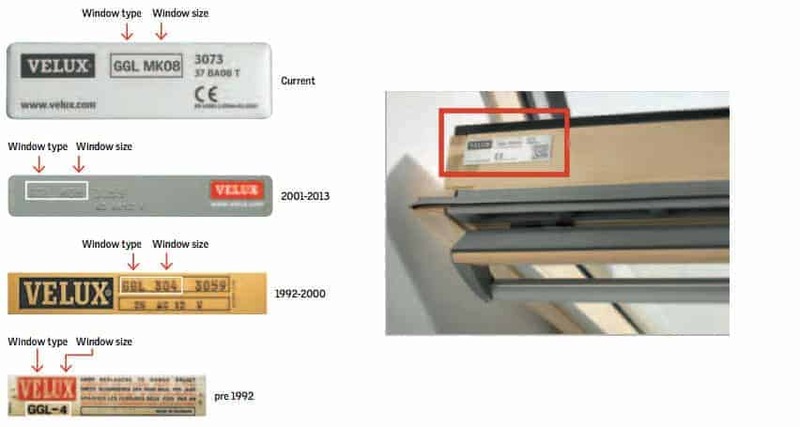 The image above shows examples of VELUX window identification plates for all years including each type of window size code. As long as you can find the VELUX size code you can go ahead and order blinds for your VELUX windows. All our blinds come with quality thermal blackout fabric, solid metal fixings, child safety certification and 3 years warranty as standard. The skylight blinds are extremely easy to fit, check out our fitting instructions video. Step 4: (Optional) What to do if you cannot find your VELUX window size code. You may find that the VELUX Identification plate/sticker is not on the window or the information on the ID plate is worn or faded. If this is the case you will need to find out the window size by measuring the visible glass size of the window inside the window frame in millimetres (mm). Once you have taken the measurements you can compare them to our handy sizing table below to find out your VELUX window size code. 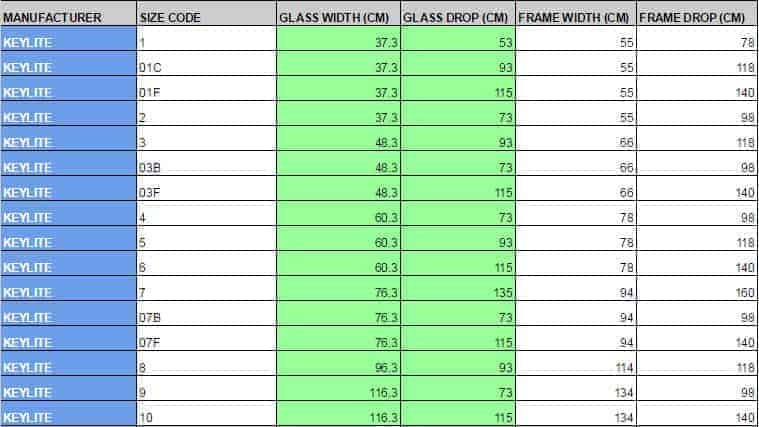 This table includes glass size measurements for every VELUX window ever made so if you cannot find your size code here, your window is not manufactured by VELUX. Please either check out our identification guides for other skylight window manufacturers or contact us and we’ll help you identify your window. Fitting your wooden blinds from Cheapest Blinds UK couldn’t be easier. You can either follow the 3 minute video above or use the text version below to fit your wood Venetian blinds perfectly. If you need help measuring up for Venetian blinds you can check out our wooden Venetian measuring guide. 3 different types of screws, each of which you’ll need later. A valance with it’s brackets for attaching to the head rail. A centre mounting bracket for blinds that are over 105cm long for added support. Make sure the brackets have the little hinged gate facing forwards away from the window. Mark the position the mounting brackets on the side or the top of the window recess. 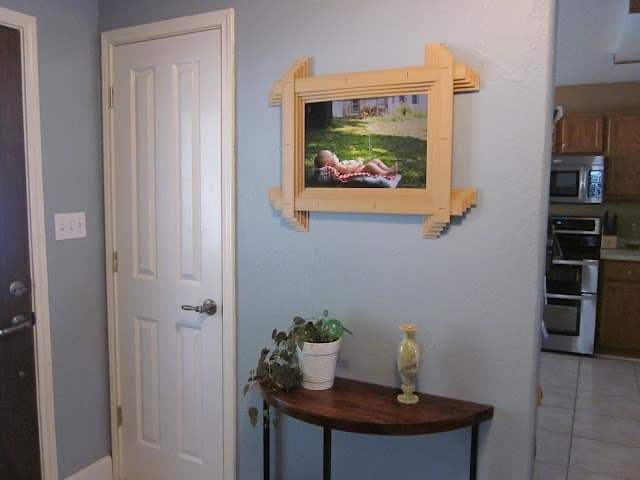 Measure the distance that any window handles stick out from the frame and mark a position for the brackets so that the blinds do not get obstructed by the handles. Now use screw number 1, the largest one to secure the brackets. Now slide the head rail of the blinds into the brackets and push the little hinged gate on the brackets closed. Screw the valance brackets onto the back (flat side of the valance). These simply clip over the top of the head rail to hold the valance in place. If fitting Wooden Venetian to doors it is recommended to fit the hold down brackets so that the blinds do not move around when the door is opened & closed. You may also decide to fit the hold down brackets to windows where there are no opening windows or on windows where you do not want to raise/lower the blinds regularly. Always fit the child safety cleats that come with the blinds even if you do not have children. It’s quick and easy and it may prevent a serious accident one day. It’s a no brainer. If you have any questions you can call us FREE on 0800 112 3335. Roller Blinds On Sale NOW! Hey bargain hunters, we have just launched a new small but exclusive roller blind range called Natural Essentials and are having a product launch sale and it’s a BIG One! You will not find a cheaper made to measure roller blind on the Internet today! They start from just £5. Although the price is very cheap the quality of the blinds is excellent. The natural woven Raffia fabric dims out the natural light perfectly and offers very good privacy for any room. They come with a quality controls for raising and lowering, a solid aluminium bar along the bottom of the blind to keep the fabric hanging nicely and they come with UK child safety certification and 3 year guarantee as standard. All our blinds are manufactured in the UK and come complete with all fixtures and fittings along with easy to follow instructions for DIY installation and child safety cord fixings. Windows are a one of the largest causes of heat loss in your home, most properties these days have double glazed windows which help but if you own an older property, you may not and not have the money to install them, it can become expensive. A good alternative is to install blinds in your home. The best kind of blinds and curtains for energy saving are blinds with thermal qualities, these use a protective coating that reduce heat in sunny weather and keeps the heat in during the Winter months. That being said, pretty much any blind you install will save energy to an extent and can help save money on electricity and heating costs. There are two different kinds of blinds available: interior and exterior. Interior blinds go on the insides of windows. Exterior blinds go on the outsides of windows. Both are an excellent way to save energy in your home, however please be aware that Exterior blinds cost considerably more than interior blinds and usually require a qualified professional to install them. Interior blinds on the other hand can be fitted by anyone with basic DIY skills. Provides good insulation in colder weather & good temperature control in the summer. Different types of blinds save energy in different ways. Some have better insulation properties than others whilst others are better for the controlling light and heat entering the room. Any type of blinds can control the light coming into a room. Natural light saves money on lighting and electricity costs yet allow home owners to retain their privacy in the evening. Ever stood in a greenhouse in the summer and thought to yourself how hot it is? To a lesser extent, this is what happens in our homes through our windows. Similar to how a magnify glass works, light shines through glass and it creates heat. Controlling the amount of light and heat entering the room therefore controls the temperature. As you would imagine different types of blinds are better at keeping the warmth in than others. Aluminium blinds for example provide very little insulation. However, wood and fabric blinds provide much more insulation and are well worth the investment if keeping the heat in is important to you. OK so you’ve decided to replace your old wooden blinds? But what to do with the old ones? Chuck them in the bin? No way Jose, Let’s make something Epic! Check out these cool ideas we found. Dismantle the old wooden blinds so you are just left with the slats. 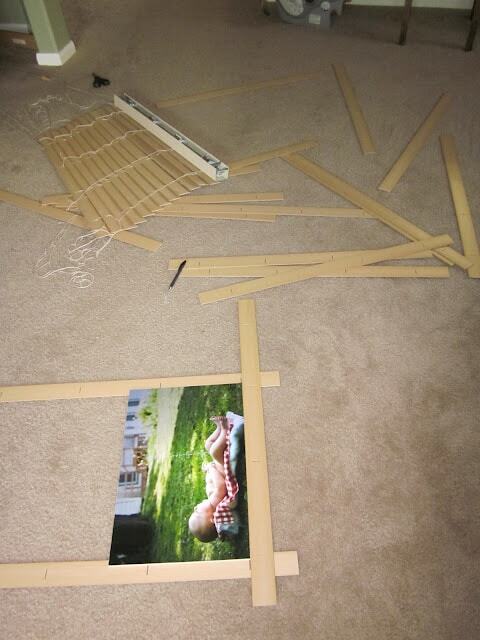 Get your picture and start laying out the first slats around the picture, measure and cut them to size and glue the first layer together. Now measure out the next layer, this should be slight smaller than the first. Cut that to size and glue into place. Repeat this step for however many layers you want, remembering to make each layer shorter than the last. 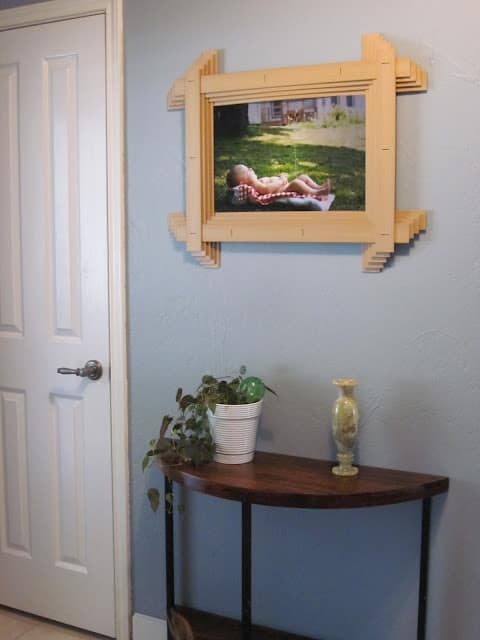 Behold, look what you have created, you DIY superhero you! What are you waiting for? Go hang that bad boy up! Measure and mark out where the panelling strips will go. Feel proud, very very proud..
A while back, it was thought that skylights were only a preserve of the rich. However, this is not the case. Anyone who wants to flood their home with natural light can install skylights quite inexpensively. They can prove especially useful during the winter months when there is very little natural light. Aesthetics is one of the most commonly ignored aspects when installing skylights. It is important to remember that one of the main reasons for skylights is aesthetics. This includes both the inside and the outside of the house. A skylight should typically be installed facing away from the street. In this way, it is still able to bring in light while at the same time not altering the image of the house. When installing a skylight, the windows and doors should be integrated into the entire design. This will usually entail trying as much as possible to have some coordination between the skylight blinds and the windows and doors. One of the main problems faced while installing skylights is light control, particularly during the summer. Sometimes, the sunlight can be too much and this makes it uncomfortable to live in such a room. It may be OK to avoid a bedroom until the evening. However, this may not always be possible, if the skylight is in the kitchen for instance. Many people also find that they are waking up earlier than usual due to bright light shining on them first thing in the morning. Furthermore, ultraviolet light from the sun usually has a bleaching effect and may cause the appearance of a bleached spot on the floor. This means that the type of flooring material needs to be carefully considered. Skylight Blinds are the most effective way to control glare from sunlight. As a result, the room can be used at any time of the day. Some skylight blinds are made of blackout material, which also helps to block harmful UV. In essence, they act as a sunscreen. Another common problem with skylights is temperature control. During winter, the skylight can make the room extra chilly. 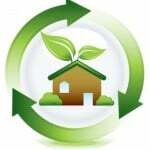 Consequently, this can have the effect of raising the energy bill. In summer, the reverse is true. This is where a skylight blind comes into play. Look for blinds with thermal fabric, these type of blinds will keep your room cooler in the Summer and warmer in the Winter. The other common technique for controlling heating is the orientation of the skylight. A South facing skylight will bring in more heat than a North-facing skylight on sloping roofs. Skylights and skylight blinds can either be operated manually or motorised. If the home has a very high ceiling, using a manually operated blind may not be very effective. If the skylight is not too far out of reach you may have the option of using an operating pole for your skylight windows and blinds. 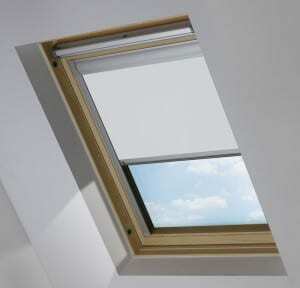 Alternatively, a motorised skylight blind is not very expensive and is quite easy to install. Which Skylight Blind do I need? There are many skylight window manufacturers these days and each manufacturer has a variety of designs and sizes to suit customer needs. The first thing to establish is which manufacturer your skylight window is made by. There will either be some branding on the external of the window or if you open the window, along one of the edges you will usually find an information plate which states the manufacturer’s name, serial number and window sizing information. The information you need is the manufacturer and the window size code. There you will find step by step instructions including pictures on how to find your skylight window size code for all manufacturers. If you are still struggling to find your window size code, please measure the visible glass size and contact us, we’ll find it for you in our manufacturer database. We offer a large range of skylight blinds for sale, these can be found here. 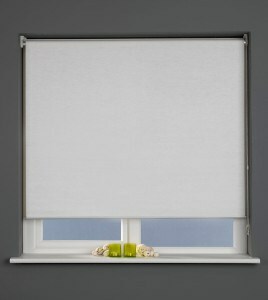 All our blinds come with quality thermal blackout fabric, solid metal fixings and are certified child safe. They are extremely easy to fit (see fitting video below) and come with 3 years warranty as standard. Delivery takes approx 3-5 days. Skylights are now available to many people. This has been aided by the development of technology that makes production cheaper. With the development of skylight, skylight blinds have followed suit. The design and material for making skylight blinds are quite varied. Whatever one’s need may be there is undoubtedly a skylight blind that offers a solution. 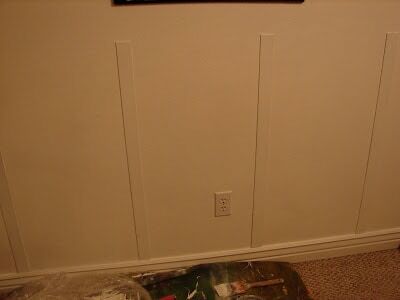 When purchasing a blind, one should aesthetics in mind. It is important to combine functionality and style as often as possible. Just because it is above eye level is no excuse for installing an unsightly skylight blind. Our Massive Roof Blind SALE is on NOW! 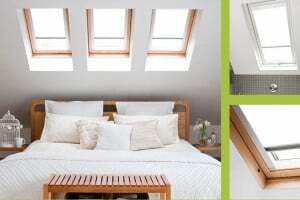 £30 For ALL VELUX, FAKRO, Keylite & Rooflite Windows. Fed up with those plain hum drum vertical blinds in your home? Colour holds a strong importance on our lives, in the clothes we choose, the colours we paint and the home furnishings we buy. Colour choices we surround ourselves with, directly and indirectly affect the way we think, they also influence how we respond physically and psychologically to what we see. One of the most important factors to consider when choosing a colour is the ongoing impact it will have on your emotions and thought processes. 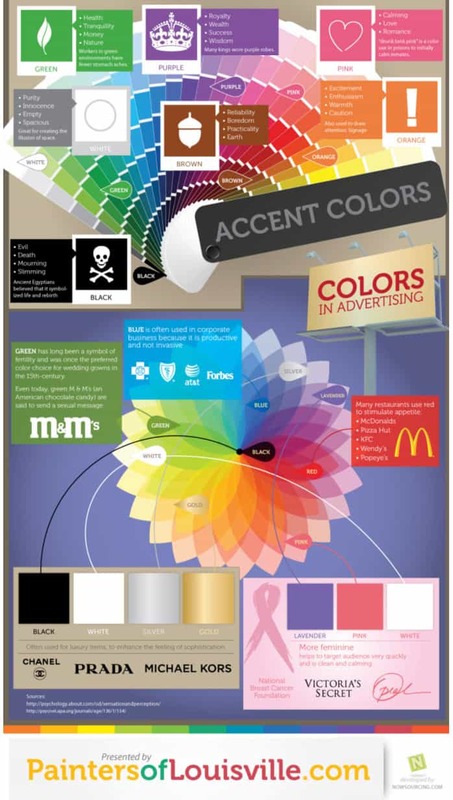 >The above info-graphic from Pinterest is a great illustration on the affects colour can have on our lives, in our homes and work environments. It also gives an insight on what attributes are synonymous with which colour.